I won’t claim to be the biggest Doctor Who fan. I only just leaped on board the bandwagon a couple years ago. I don’t have the type of memory that retains tiny facts and details about TV shows. I admire people who can site some rare fact about a show and link together two episodes that you had no idea had anything to do with one another. I do not have that memory. I do have a love for one of the few amazing story lines left on television and that is what season 9 brought us in its opener this past week – more of its great story telling. Clara Oswald has been a confusing character from the beginning. She was indeed the Impossible Girl and has saved The Doctor more times than we can count. I had high hopes for her in the season 8 opener “Deep Breath”. I had high hopes for Twelve as well. In the first few episodes they seemed to deliver. 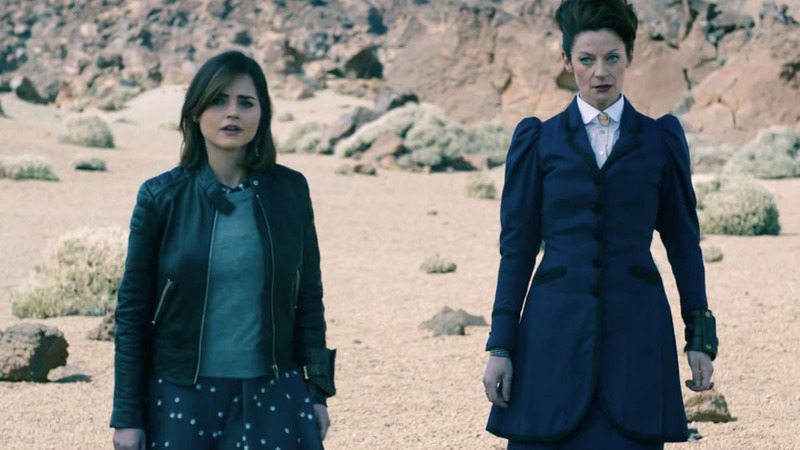 When asked in “Deep Breath” where the doctor was, who can beat Clara’s line, “I don’t know. But I know where he will be. Where he will always be. If the Doctor is still the Doctor, he will have my back.” With the exception of a few episodes following that, though, I didn’t see much of “our Doctor” or the Clara we’ve come to know and love. And so we begin season 9. The opening is a surprise, with us discovering that the little boy in the war zone is Davros. Personally I feel that the Daleks have become overused. It’s no longer a surprise to see them appear. While I love that it ties us back to the original series in many ways, an enemy overused becomes one that is less shocking and terrifying with each appearance on screen. The Doctor’s enemies are searching everywhere for him. We are brought back full circle when the sisterhood is asked, “Where is the Doctor?” and they answer, “Where he always is; right behind you and one step ahead.” The line reminds us of who the Doctor is, and where he will always be for his friends. From there, except for brief moments, I was disappointed. How can you be disappointed when Peter Capaldi comes out on a TANK rocking out on a guitar?? You can’t be disappointed at that moment. I have thoroughly enjoyed Missy’s role in the show. She plays the role well and is fascinating to watch and see what she will do next. When she is sent the confession disc, we marvel at it not being sent to Clara. But really, who knows the Doctor better than a former best friend? We all know a friendship that lasts what seems forever has many secrets revealed in it, many moments shared. Those moments don’t disappear when they friendship ends. And we have always seen the Doctor have difficulties in dealing with the Master and disposing of him once and for all, as if something is holding him back. Clara was at one time the Doctor’s conscience. Will she continue to be in this season? I guess we will see when the show continues. Will the Doctor kill the child who is ultimately responsible for so many deaths? Yes, we saw the T.A.R.D.I.S, Missy, and Clara destroyed, but as we all know when you’re a Doctor Who fan….things are rarely what they seem.